Alison Treat | Trick or Treat! 30 Oct Trick or Treat! I may not be writing here on the blog much lately, but I have been thinking a lot. This time of the year, I always think about Halloween—and why our family chooses to celebrate it. Growing up, my Halloween roots were a bit of a mixed bag (pun intended). I remember actually trick-or-treating only once. I must have been about five. I was a fairy princess—my costume was the flower girl dress I’d worn in my uncle’s wedding, along with wings my mom made. I remember one of my big brothers dressing up as a garbage bag full of autumn leaves. It was dark and cold and exciting to be out with the big kids. Afterwards we savored our candy by the blazing fireplace. After that, we moved to my parents’ hometown, and we never celebrated Halloween again. I don’t remember caring very much. Maybe I just wasn’t old enough to form my own opinion on the Holiday yet. Our church often had a “Harvest Festival” to give us an alternative to the demonic activity of Trick-or-Treating. Though I wrote that last sentence sarcastically, I don’t mean to make light of an issue that many Christians take seriously. Sometimes, though, I think we Christians take ourselves far too seriously. I spent the rest of my growing-up years being told that Halloween was the Devil’s Holiday. That it was a time when witches worshipped Satan. That it originated in occult practices and as a follower of Jesus, I couldn’t participate in it at all. I kind of believed that. I have never liked the scary, ghoulish, demonic images tied to Halloween. I believe that evil is a real force in this world, that Satan exists and is the Enemy of our souls. I want to stay far away from anything that glorifies the Enemy. As an adult, though, I’ve come to the place where I don’t view trick-or-treating as evil or demonic. I’ve heard a lot of different arguments for and against Halloween. Refusing to celebrate it because of its Pagan origins just doesn’t hold water for me. If you’re going to refuse to celebrate a Holiday on those grounds, you’d better eschew Christmas as well. Maybe some of you do, and you’re certainly entitled to your opinion and your practices. The Puritans celebrated neither Christmas nor Halloween. I, however, may be a purist, but I am by no means a Puritan. A couple of tricky treats (a few years ago). I believe I’m here to shine a light in a dark world. I don’t think turning off my porch light on October 31st does that. (Of course, in my neighborhood, nobody but the wildlife notices that it’s on.) I don’t believe telling my children they can’t dress up on Halloween or forcing them to dress as Bible characters encourages them to love Jesus. They love dressing up—who doesn’t? This year they love dressing up like Batman and Princess Anna. Like all children, they love candy. Halloween is part of our culture. I may be countercultural in some ways, but this isn’t one of those ways. The reasons aren’t compelling enough. 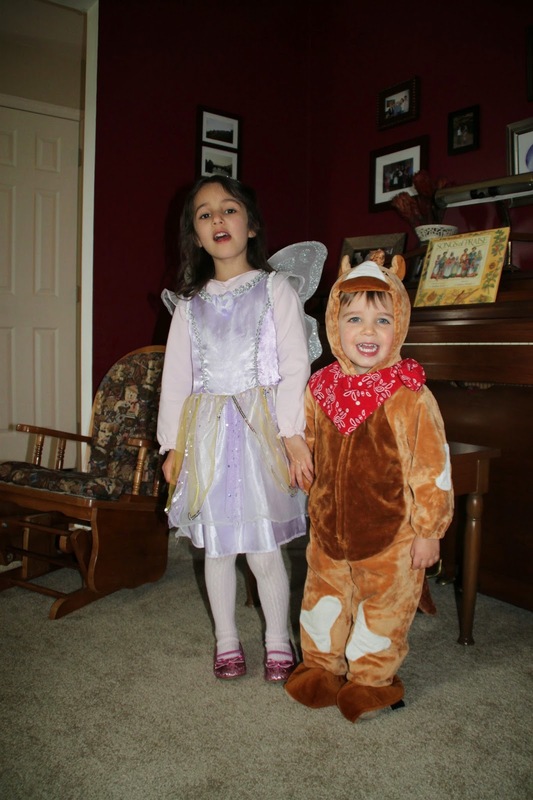 We don’t run around like crazy going to every trick-or-treating event within a 20-mile radius. Some families do that, but that’s just not our style. We do dress up (or the kids do, at least). We let them go to Halloween parties. If we have an outreach at church, we attend it as a way to participate in our community (since we live in the country and nobody trick-or-treats on our street). If our church doesn’t have an event, we might trick-or-treat in another neighborhood. Honestly, the most confusing part of Halloween for my kids has been seeing that some Christians don’t celebrate it at all. It’s good to discuss these things, though, to learn that every family makes different choices. That someday they might make different choices from the ones we’ve made. The important question for me is “How will this affect eternity?” What I’m realizing is that our cultural traditions are intertwined with Pagan rituals to such an extent that it would be nearly impossible to separate them. To try would be putting all my energy into something that won’t make an impact for Christ on my children or my world. So we celebrate. Christmas. Halloween. Embracing all of the light. All of the good and precious parts. I will point out the Christian roots of Halloween. The importance of the birth of Jesus. Yet, also appreciating the joy that comes with tradition. Another tricky year at the Treats. You can read more about the Christian roots of Halloween here. Though I’m not Catholic, I like the idea of stressing All Saints Day in your celebration. (Protestants can celebrate All Saints Day as well.) I love FIMBY’s take on Halloween discussed in this post. Modern Mrs. Darcy talks about her feelings here. Would love to personally autography your copy, Chrissie, and share some tea and sympathy! So glad you enjoyed the book. Thanks for commenting!